AlipayHK and GCash today announced the launch of a cross-border remittance service through their e-wallet platforms, powered by cutting-edge blockchain technology developed by Alipay, the online payment platform operated by Ant Financial Services Group (“Ant Financial”, “Ant”). This is the first blockchain-based cross-border digital wallet remittance service globally, offering a fast, secure, convenient, transparent and low-cost way to transfer money directly between individuals in Hong Kong and the Philippines. Alipay has applied blockchain technology to streamline the remittance process, radically improving the speed of delivery, enhancing transparency of the process and drastically reducing costs while ensuring better security measures when sending money across borders. This service between GCash and AlipayHK will provide round-the-clock, real-time money transfer between Hong Kong and the Philippines at a competitive exchange rate with much lower transaction fees, which will be further waived during an initial three-month trial period. With a few taps through AlipayHK’s mobile phone application, money will be transferred within seconds to a GCash user. Blockchain technology allows us to change and radically improve the speed and efficiencies for remittance services. Based on the smart contract, once a user submits a remittance application, all network participants including AlipayHK, GCash and Standard Chartered Bank, the first and core partner bank supporting on this initiative, are notified. The segmented procedures of the remittance process can consequently take place in parallel, enabling the verification and execution of the transaction to occur simultaneously. Through the blockchain platform, the sender and receiver are also able to track their money with every step of the way – from when the remittance application was made, until when the receiver successfully obtains the money. All information stored, shared or uploaded through the blockchain remittance platform is further encrypted with the most advanced protocols to protect the user’s privacy. Canning Fok, Group Co-Managing Director of CK Hutchison Holdings and Chairman of Alipay Payment Services (HK) Limited said, “This cooperation with GCASH to bring remittance to the Philippines using the new technology is the first step and there are many other places Hong Kong people need to remit money. I’m happy to see that the AlipayHK team is hard at work to expand this service to more people, bringing us closer to our families and friends with a cheaper and quicker solution. Standard Chartered has been an integral partner in the development of the solution and will provide the underlying banking infrastructure to support this pivotal initiative. “Ant Financial and Alipay have been exploring the cutting-edge blockchain technology since 2015. Blockchain is revolutionizing the remittance industry, and we look forward to further innovating and expanding the application of the technology in global remittances, together with local wallet partners and other ecosystem partners,” Jing added. Since the launch of Alipay in 2004 and the establishment of Ant Financial in 2014, the Company has built an integrated technology platform and ecosystem of partners to bring more secure, transparent, cost-effective and inclusive financial services to individuals and SMEs globally. The Company will continue to invest in developing its blockchain, AI, security, IoT and computing capabilities to upgrade its global technology platform for the next generation. 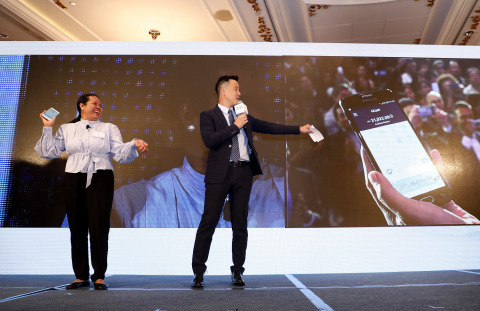 Starting from 2015, Alipay has formed nine strategic partnerships with local partners outside Chinese mainland, sharing their technology know-how and risk management capabilities to provide more mobile payment and inclusive financial services to local users. In the year ended March 31, 2018, Alipay, together with its global partners, served approximately 870 million annual active users globally and over 15 million small businesses in China. Currently, over 20,000 local retail outlets have supported electronic wallet for payment, covering large chain stores, supermarkets, wet markets, taxies and others. Features of electronic wallet include payment on Taobao and TMall, P2P transfer, electricity payment, telecom payment, etc., making Hong Kong residents’ lives more convenient by integrating mobile payment into daily lives. Ant Financial has formed international partnerships with global strategic partners to serve local users in those markets, and we serve Chinese travelers overseas by connecting Alipay with online and offline merchants in popular destinations. By the end of March 2018, together with its global JV partners, Ant Financial served 870 million users worldwide. Brands under Ant Financial Services Group include Alipay, Ant Fortune, Zhima Credit, MYbank and Ant Financial Cloud.